ACT! is a popular CRM, or customer relationship management program. It was formally owned by Sage Software, but was acquired by Swiftpage in 2013. Act! will help you manage your prospect and customer relationships - or any of your vendor, employee, or other business relationship for that matter. Act! will assist you in a variety of tasks related to working smoothly and efficiently with your customers and other contacts. When preparing to make a phone call, start by retrieving the contact’s record. With their record on your screen you’ll be able to see what their phone number is and who you’ve talked to there in the past. Before starting your call, you’ll be able to make a note of what you plan to discuss with them today. If they are not in, your call notes are automatically saved so that when you try the call later, the information about the call will already be there. As the months go by and you continue logging your calls, you’ll be able to review what was discussed and on what date - with each of your contacts. If you call someone and they make a promise to you, set a reminder for a few days after date by which the promise should be completed. Later, when the reminder pops up on your computer screen, you’ll be able to check back with the person if the promise has not been kept. Click an icon and send an E-mail to a prospect, customer, or other contact. When the E-mail is sent, the text of the message is stored in ACT! as part of the customer’s record. This means that later on there is no need to search around to try and figure out what you said to whom. Your correspondence is stored together along with all other related customer information in one screen in a very logical fashion. 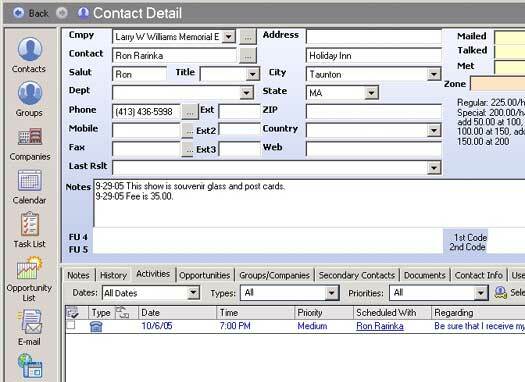 Suppose you want to send an E-mail to a group of contacts. This is not a problem since every contact can belong to as many groups as needed. Instead of sending your E-mail to a particular person, the E-mail can be addressed to an entire group. You write and send one E-mail, but it automatically goes to every member of the group. Click an icon and send a letter to a prospect, customer, vendor, or other contact. When you click this icon a letter writing screen is displayed. The letter writing screen is already addressed to the contact you have selected, even before you start typing. From the contact record you can easily send personalized letters to all members of a group or to all your contacts. Click the mail merge command and a letter displays, waiting to be personalized and automatically printed. When you are finished personalizing the letter, as many copies as you need are printed. Each letter contains the personal information of the contact it is addressed to. If you place a call, but the person you are looking for is not in, with a few clicks of the mouse you can schedule a reminder to retry the call at any future date and time that you select. When that date and time arrives, ACT! will popup a reminder showing you that the call is needs to be tried again. The reminder screen contains the name of the person you are calling, their phone number, and what it was you were planning to talk about.